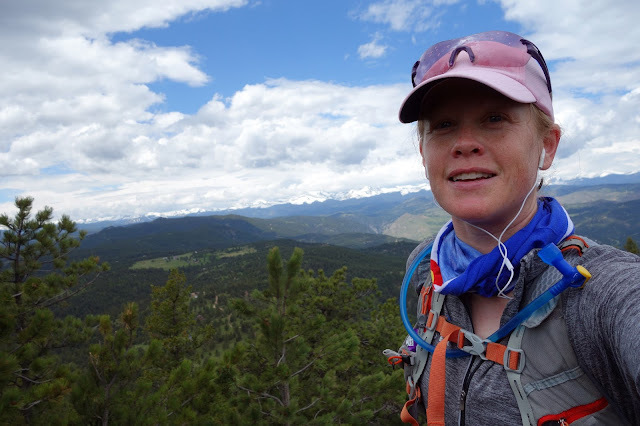 This week was a fitness test of sorts for me — I wanted to put in a string of hard efforts to see whether my breathing and heart rate remained consistent throughout. One goal was to top 20,000 feet of climbing — I did that with 21,507 — with around 20 hours on the move, and I did that too. It was a good week — long and meandering, given to beauty and reflection. Wednesday was Beat's birthday. While I'd be thinking about it all week, the fact embarrassingly slipped my mind that morning. We were standing at the back door, watching the hummingbirds and talking about the day, when he said, "so my computer just reminded me it's my birthday." He'd forgotten too. 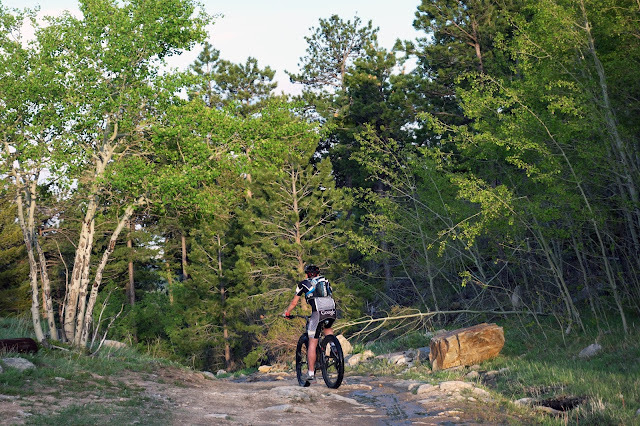 I asked him what he wanted to do, and surprisingly he decided on a long bike commute from work, via the steep Betasso Link Trail, Magnolia Road — four miles of pavement with a 12 percent average grade — then onto rolling gravel and the flooded county road that would take us home. It was an interesting choice for a birthday but ultimately a beautiful ride. Churning up Magnolia Road, there was plenty of time to ponder birthdays and summer and the relentless march of life. Riding the Betasso Link Trail, climbing 800 feet of difficult singletrack mostly to avoid a road tunnel. One of my Facebook friends recently posted a thread of comments that I've been thinking about this week. 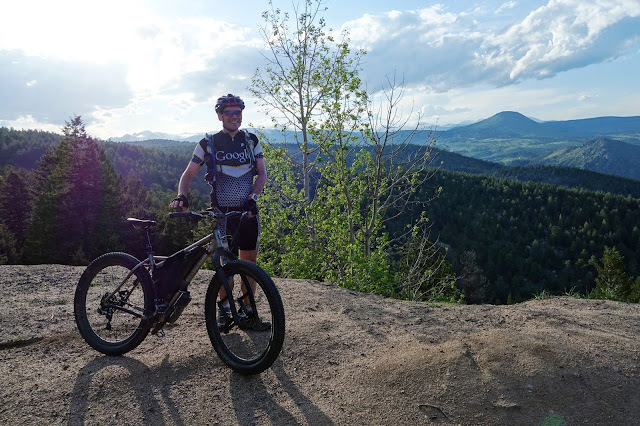 Mike lives in Salt Lake City, and he's someone who I met only briefly, after the 2013 Bryce 100 race near Bryce Canyon. Our initial interaction is one I don't remember well. If it weren't for the strange universe of social media, both of us likely would have soon forgotten the other. But for the past four years, I've frequently nodded in agreement with the words he writes. Our viewpoints match on many levels. Now Facebook's algorithms assume he's one of my close friends and prioritize his updates. I find this both amusing and unsettling — and I imagine this happens similarly with online dating sites — that software can know us better than we know ourselves. His most recent update was a simple one — "AMA" or ask me anything. One person asked him, "why do you run so much?" His reply: "I don't know the answer, really. 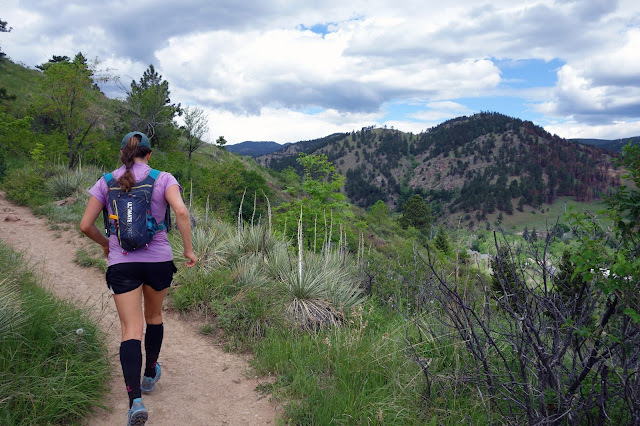 The closest I can get to an answer to that is that I have a lot of passion and having a well like long-distance running assures that it's sequestered somewhere safe. There are a lot of ways in which I regret it." Beat at an overlook on Magnolia. It was a beautiful evening. Approaching Twin Sisters Peak on a soon-to-be-flooded county road. The problems of the world are large, and they appear as though they're becoming larger. As individuals in a world of seven billion people, confronting these problems feels logically and emotionally like hanging off a railing of the Titanic with a bailing bucket in one hand. Despair seems to be the most natural reaction, and yet we still need to live our lives. We still need to forge hope, which we nurture through our interactions with other people. By improving understanding and empathy, we stand a better chance of fostering the cooperation and innovation necessary to confront humanity's sweeping problems. Hope is forged by embracing the future. But I believe despair is best conquered by embracing the past. This is why long-distance runners, cyclists, swimmers, and others are often most happy in the midst of their pursuits. Within these movements we create a primitive world where we can generate and thrive on our own energy. Our passion — the energy all too easily funneled into worry and pettiness and rage — is directed to the peaceful rhythm of forward motion. When we pursue this motion with others, we connect with them on a fundamental level, which is the basis of intimacy. And when we run alone, we travel into a space that's almost effortlessly free of the usual barrage of thoughts and worries. If we sat on a couch all day, we'd only become more isolated, more physically unwell, and more anxious. Comfort is its own oxymoron. in a deep, sludgy mud puddle, and I tipped over and submerged most of my body. Mike said in some ways he regrets long-distance running. This is true as well. It's a selfish pursuit, absolutely — most everything that humans do could ultimately be categorized as selfish. Is running any more of a waste of time than playing music or painting or planting a garden when there is a supermarket down the street offering the same products more efficiently and cost-effectively? It's all up for debate at this point in history. We can decide our role in the world is meaningless, or we can decide what's meaningful to us and those we care about. Staying present, staying connected, staying away from despair — that all means something. Can long-distance motion decrease our quality of life, leave us injured, make us sick? Of course. Nothing in life is risk-free. Am I sick because of my lifestyle? Possibly. Like many diseases, thyroid issues are becoming increasingly more prevalent. The cause is as likely to be toxins in the environment or luck of the genetic draw as anything else. I do think it's interesting that I became hyperthyroid when I became sick. My body is still exuding excess energy even as it deteriorates. Now that I'm less sick, I certainly appreciate being less likely to have a deadly thyroid storm. But one of my favorite aspects of newfound health (for which I have modern medical science to thank) is how great I feel now, compared to several months ago. I don't suddenly have all this extra fitness where I'm so much faster and stronger than I used to be. I'm just happier ... less desperate ... as though there's nothing I can do that will leave me flattened (of course there is.) Still, I can run the difficult Walker Ranch loop on Monday, "PR" my Tuesday-afternoon routine hilly gravel 10K, pedal five hours for Beat's birthday on Wednesday, increase all of my weights during my gym routine on Thursday, and enthusiastically agree when Eszter wants to run Boulder's classic "Five-Peak Skyline Traverse" on Friday. 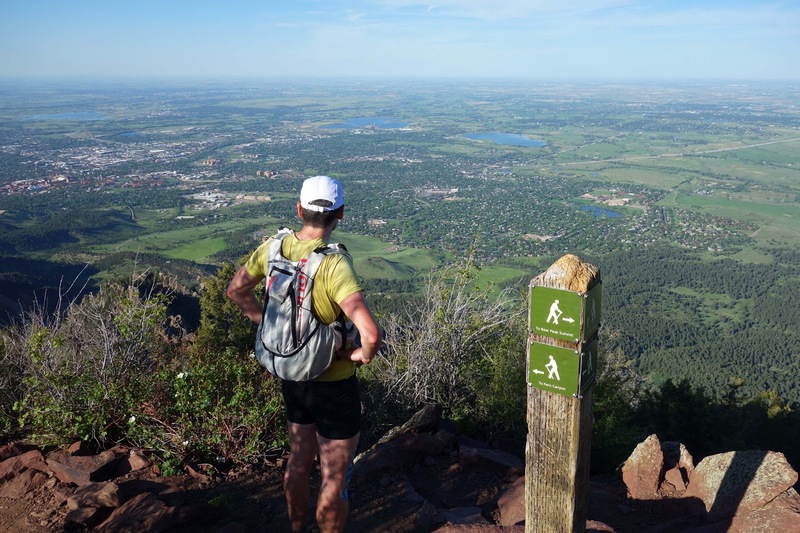 Boulder's mountain skyline is comprised of five summits — Sanitas, Flagstaff, Green, Bear and South Boulder. 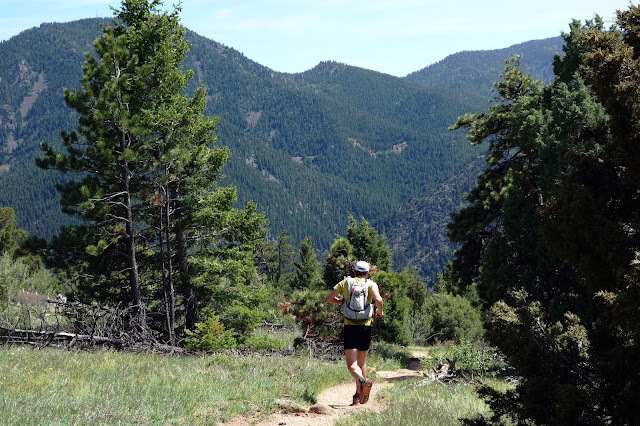 Any one of these is a solid effort, so to tackle all five in one go has become a popular hiking challenge (or running, or run-hiking in my case.) 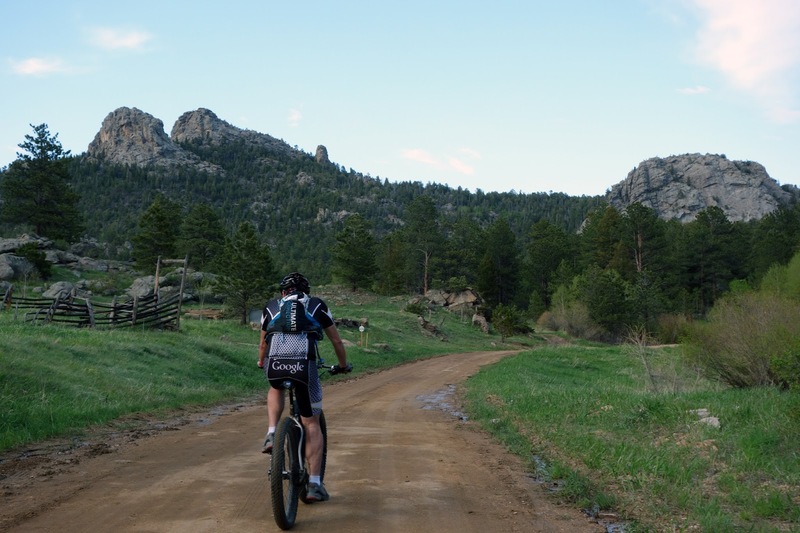 Our route was 22.5 miles with 6,600 feet of climbing, traveling north to south. 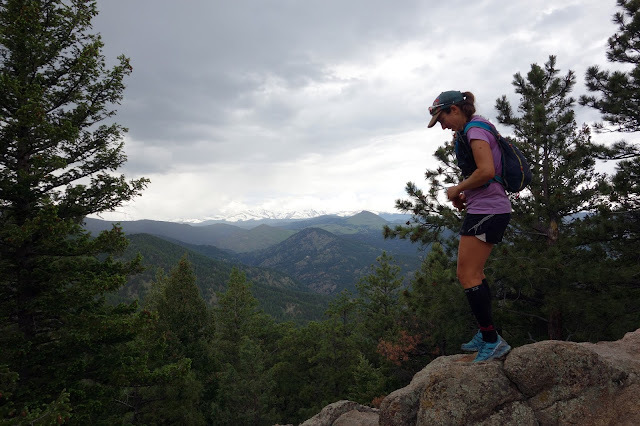 Even though Eszter grew up in Boulder, several of the trails were still new to her. 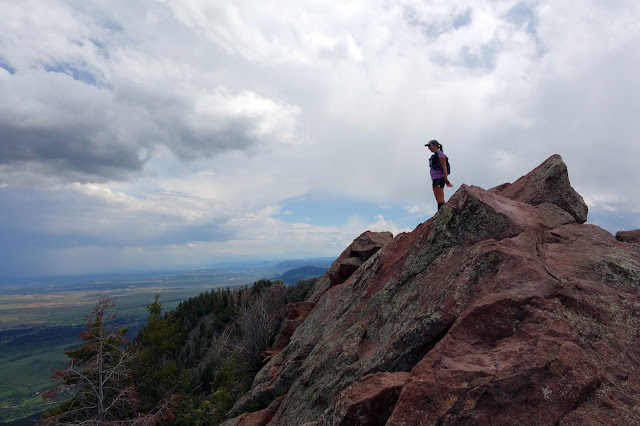 I started out in Boulder as a runner (run-hiker), so the only new ground I covered was wandering around Flagstaff as we attempted to find the summit. We went to the overlook, but I think it's still 100 or so feet to the true summit. I guess that means we'll have to go back. Selfie from the top of Green, where we "made it count" by scrambling up to the geographic marker. I run these mountains frequently, but it's rare for me to scramble all the way to the true summits, being slightly technical and ultimately meaningless, as is the case with many endeavors. It is fun to embrace an arbitrary challenge and make it count. Challenges are good, but this run was pure fun. 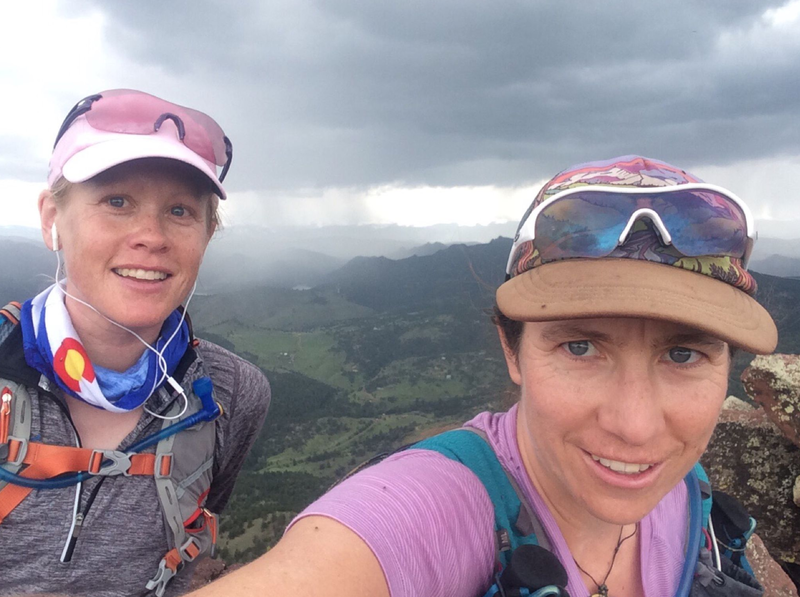 We watched the skies for intermittent thunderstorms, jogged through mud beside vibrantly green hillsides and wildflowers, stuck close together and chatted about life and everything else for most of seven hours. 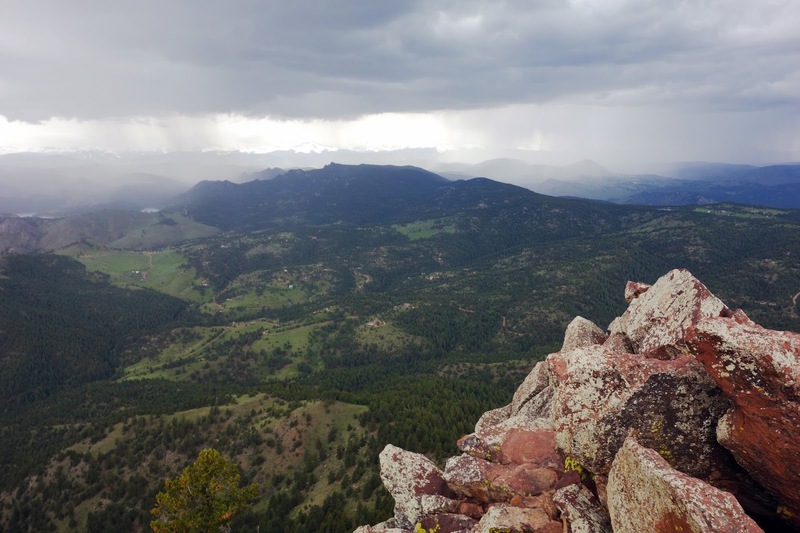 Watching a storm move in from South Boulder Peak. Eszter was curious about scouting out a more aesthetic route off the mountain by exploring a ridge Beat's friend calls "Hairy Backside" — thus avoiding the out-and-back to the summit and completing a true traverse. I was naturally frightened by the characterization "Hairy Backside." As is often the case, I let my fears get the better of me and talked her out of it. The weather proved a strong deterrent as well, with thunder rumbling closer. Fearfulness is my default setting and I battle it every day. 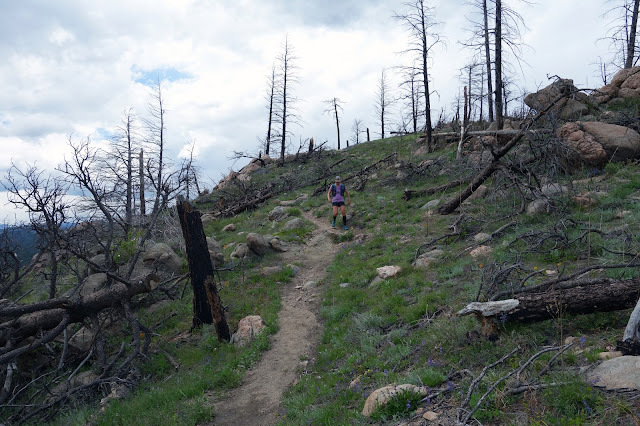 Were it not for my prioritization of adventure over pure self-preservation, I probably would have been paralyzed by fear long ago, sitting on a couch somewhere and watching these summer thunderstorms, wide-eyed and trembling despite shelter and safety. That I've been able to accomplish the adventures I've accomplished is still a source of bemusement for me, a testament of the possibilities when we reject our worst instincts. Of course it would have been even better to explore Hairy Backside. But we were both glad for the shelter as a deluge of rain and hail hit us while we descended beneath the tree cover of Shadow Canyon. Every time thunder clapped, Eszter yelled, "Boom!" and we both laughed. Are humans inclined toward silliness because everything we touch is dangerous? Just something else to ponder. Fearfulness did get the better of me this weekend when Beat and I considered heading into the high mountains for a mud/posthole/snowshoe adventure. After poring over any information I could find online, I became convinced there was risk of wet slab avalanches on the upper slopes. Maybe — or maybe there was barely any snow on the trails we hoped to hike. I won't know now. My inclination is to avoid snowy mountains altogether. I do hope I'll face this fear eventually. Instead we rode bikes on Saturday and committed to a hard run on Sunday. I struggled from the beginning; it was a warm afternoon and the UV index was severe. Also, my legs were a touch dead. How did that happen? In all of my experience, this is usually the place where training "counts." Our bodies can do what our bodies can do; it's usually more than we think, and not necessarily as much as we'd like, but it's a fairly straightforward progression. More interesting, in my experience, is the practice of shifting perspective. So it's hot and my legs are dead — why should that matter? No reason to focus on these negative details when the hillsides are vibrantly green and wildflowers line the trail, and as always it's a great day to be alive and moving through the world. Exploring a climbing access trail in Eldorado Canyon. 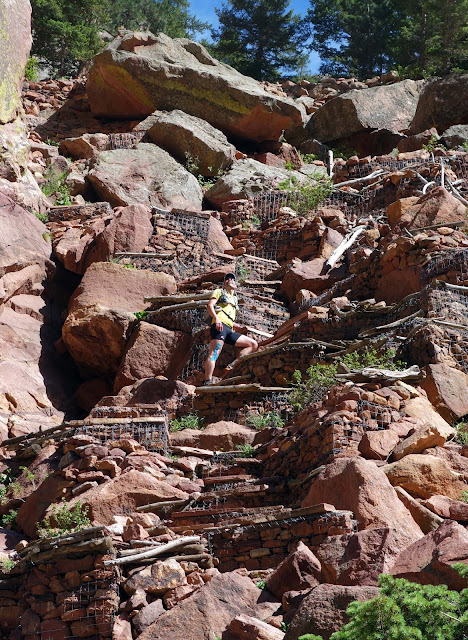 I plodded up Shadow Canyon, my long-sleeve shirt stiff with dried sweat and the skin on the back of my neck still radiating solar heat into a buff. I suppose I can't completely shift my perspective, nor do I have an endless well of energy. Sometimes, only fumes remain. What we do with that matters more. The plains are so green these days. "I believe in vulnerability as a practice. Every good thing I've ever had in my life has come from a place where I could have failed (and often have). If we're to have the courage to love and be loved when it really matters and the stakes are high and we're scared, we need to know how to lay it bare." In that spirit, if you've made it this far into this rambling post, I invite you to "Ask Me Anything." Post a comment or e-mail jillhomer66@hotmail.com. I'll write answers for my next blog post. If I feel the question is inappropriate there's a chance I'll ignore it, but I hope to achieve a similar vulnerability. This is an awesome post, thank you. Hey Jill. Here's a question. Is there something you hope to accomplish during the course of your life? Some theme that you hope people will mention in your obituary or otherwise after you die? Or maybe a better question is "How do you hope to be remembered after you die?" Just a correction to one of your comments - there isn't any evidence that "toxins" contribute to thyroid disease. Legitimate studies show an increase in thyroid cancers (which may be explained by the improvements in screenings and/or increase in demand for screenings, as both thyroid cancers and thyroid disease frequently go undiagnosed) but show that thyroid disease (functional issues of the thyroid gland) is linked to areas with an absence of environmental source of iodine/an iodine-sufficient diet. Thyroid disruption: mechanism and clinical implications in human health. "Environmental factors influence the occurrence of AITD of approximately 20%, as they are associated with the activation of innate immune response and AITD development in susceptible individuals." There's growing evidence that popular household flame retardants found in lots of clothing and home furnishings might cause thyroid issues. Cats might well be the canaries in the coal mine as their exposure is so much greater largely due to their grooming practices. I think the question I want to ask is this -- with everything in your life, how do you when to ask for help? Obviously, dealing with illness will be the topic of your next book. What's the target date of publication? 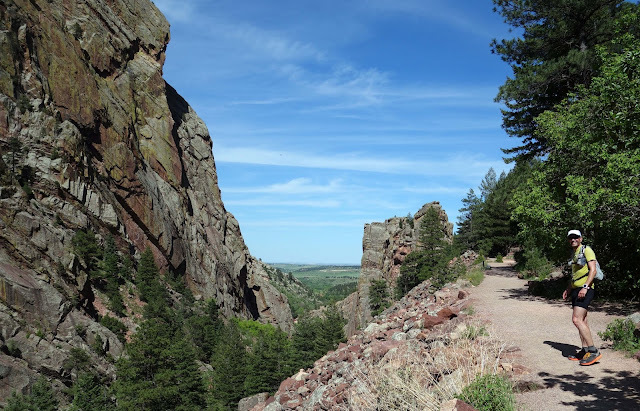 Apropos of nothing, adventurer that you are, sometimes as part of your Boulder indoctrination, you ought to get someone to lead you up the Third Flatiron. You'd really like it. Good post, sounds like you are in a good place. My question would be, with all of your solo adventures, how do you keep yourself from being scared of the dangers of the world, like animals, people, etc? Does this ever keep you from getting started? I suspect it doesn't but I want to understand why. Hi Jill, greetings from Ocala, FL! Long time reader, first time commenter - thank you for all the inspiration, laughs and insight. 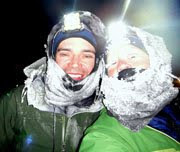 How do you keep clean during multi-day endurance efforts in regards to hygiene, and along with that, deal with waste? I know its a very personal subject, but as a fellow female, I have not encountered hardly anything on this subject. Also, how do you manage to take such consistently fantastic photos while in the midst of strenuous activity? What's the one adventure you keep dreaming about, but haven't yet done? omg I have so many questions! 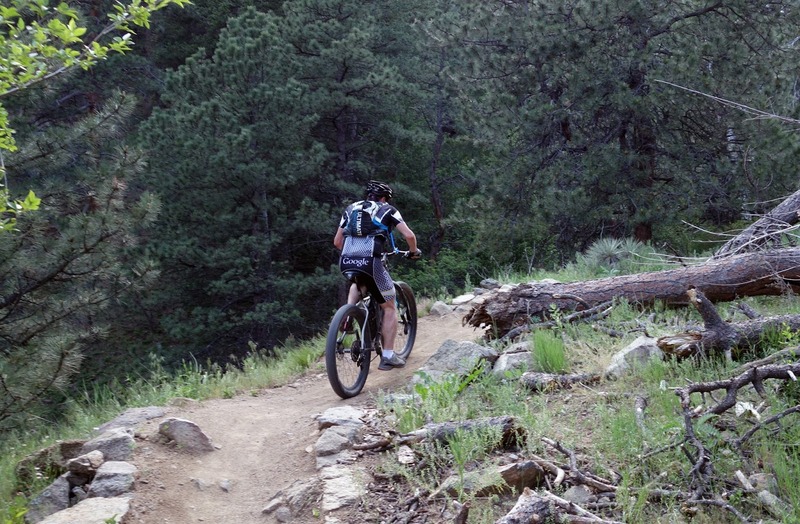 Maybe unanswerable, but how do you stay so focused on outdoor adventures? Or do you have other hobbies that you just don't write about on this blog? Also are you perfectly content to have a small dedicated readership? I'm asking because it seems like your blog is a hidden gem, which I selfishly love because I managed to find it, but then I think how your talent for writing and photography has the potential to inspire so many more people. Finally, what was the most memorable trail meal you've ever had?